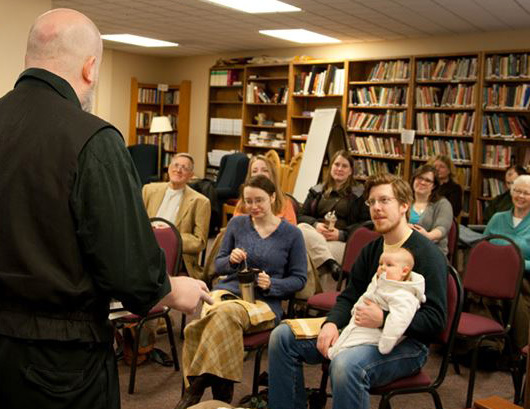 Sunday School classes regularly meet from 9:00 am to 10:00 am on Sunday mornings from September through May for interactive, age-appropriate, application-oriented studies of the Bible. We consider our regular, corporate, and interactive study of the Word of God to be a crucial part in the discipleship process of growing in our faith. For the past few years Pastor Kevin had taught an extended course on Church History. I know what you're thinking--but this class was not only informative, it was also incredibly interesting. We've all heard the phrase, "history repeats itself," and we're learning how true that is. If you missed these great lessons they are still available in multiple formats... click here and you will be taken to the Church History page. The teenagers have their own Sunday School connected with our youth ministry. Click the link, to read more about our youth program and what is currently being taught in Sunday School and during our Wednesday evening meetings.